At the Easter Vigil of the Holy Night celebrated in Westminster Cathedral, Cardinal Vincent reflected in his homily on the meaning of the Paschal fire from which the Paschal candle is lit and light then radiates to every individual present. The fire is a symbol that is used once in the Church’s year at the Easter Vigil to ‘help us to understand the brilliant, life-changing newness of what we celebrate,’ explained the Cardinal. Looking at the story of Moses who encounters God in the burning bush and receives from him his mission to demand the freedom of the enslaved Israelites, we too receive a mission ‘that seems as impossible: to bring to this troubled, war-torn, exploiting world, the peace and new life of Christ; to bring to our wayward hearts, with our capacity to misuse people, to belittle them, to cast them aside, the mercy and gracefulness of Christ’. It is with the help of the Risen Christ that this mission can be met, added the Cardinal. He invited all present to hold high their candle, and to see in the tip of fire ‘the sign of God’s power and presence now given to you that you too may live in God’s freedom and be his witnesses in your way of life, today and into life eternal’. Six adults were baptised on the night and, along with those received into the Church on the same night, and two candidates, were confirmed, and the congregation renewed their baptism vows. 'This Easter Day is a call for us to renew, in our lives, the pattern of this faith,' he added. 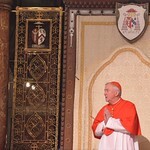 The Cardinal prayed 'for peace in our troubled world, as confrontations harden and threats increase. We pray for wisdom and prudence in world leaders and an unwavering determination for cooperation rather than conflict. Photos from the Easter Vigil are available here.